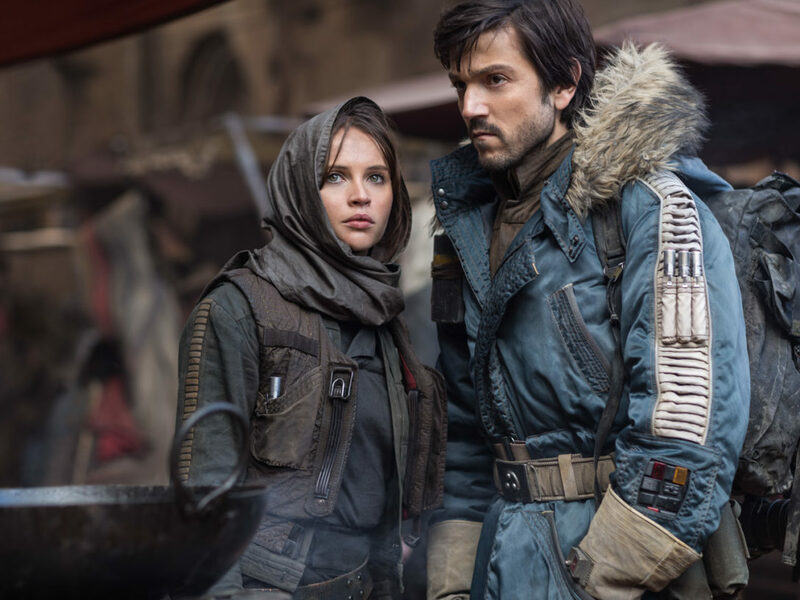 As Rogue One nears its end, our emotions sway back and forth. We understand the might of the Death Star. The ruthlessness of Darth Vader. The success and sacrifice of our fallen heroes. We move from fear to faith in minutes if not seconds. And we feel so much not just because of the imagery and the words, but also because of the music. Choirs rise to a fevered pitch. Staccato horns punctuate a villain’s anger. Strings swell from melancholy to hopeful, stirring something inside us. That’s the work of Michael Giacchino. The composer — who, with Rogue One, was the first person not named John Williams to score a Star Wars film — has written the music for some of the biggest films of the modern era, including all three new Star Trek movies, Spider-Man: Homecoming, and War for the Planet of the Apes, among many others. On Friday, October 20, Giacchino will celebrate his 50th birthday with a concert dubbed Michael Giacchino at 50 at the Royal Albert Hall in London, playing suites from across his catalog. 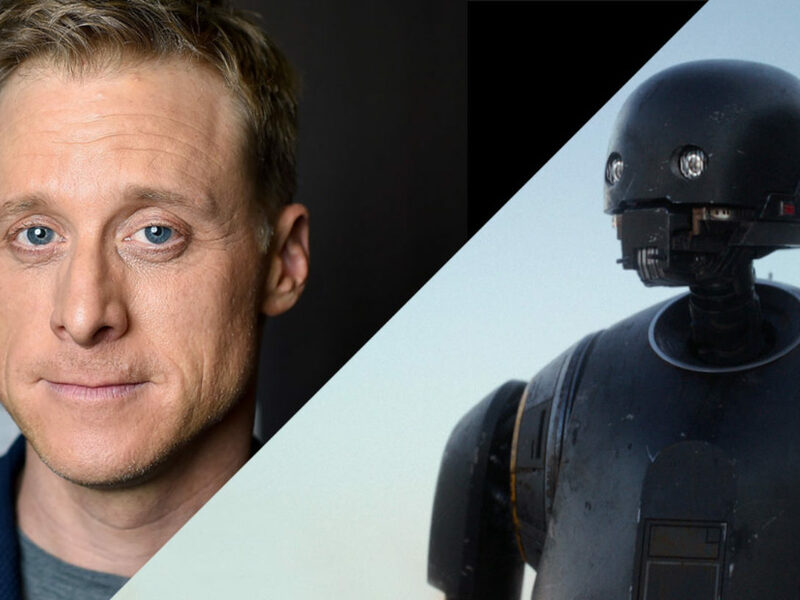 Hosted by Adam Savage, tickets for the event are on sale now, and many of the filmmakers Giacchino has worked with will be in attendance, including J.J. Abrams and Gareth Edwards. In addition, a portion of all proceeds from the concert with go directly to the Royal Albert Hall’s “Education and Outreach” projects. To mark what will surely be an evening long remembered, StarWars.com spoke with Giacchino about his father’s record collection, scoring Rogue One, and how this concert differs just a little from his original birthday plans. StarWars.com: You’re from New Jersey, right? 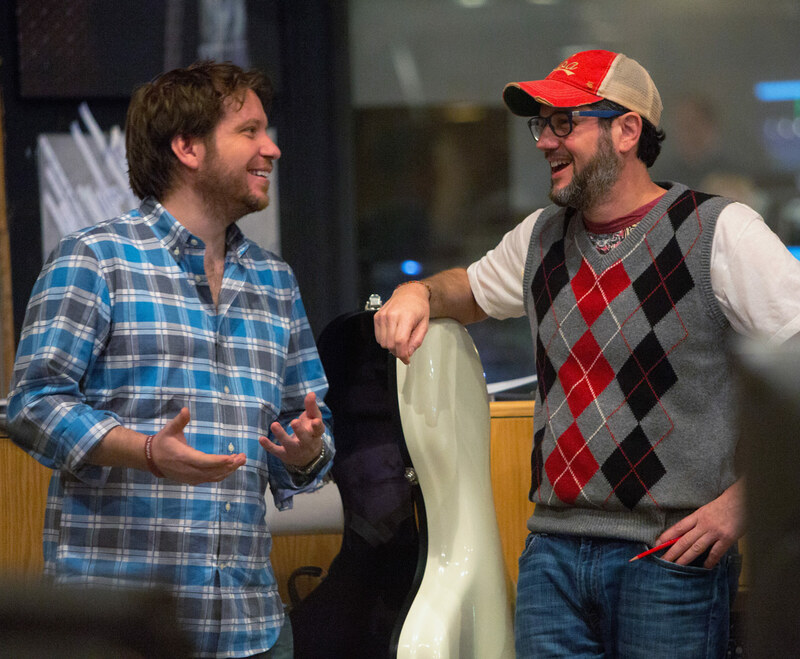 Michael Giacchino: Yes, I’m from New Jersey. StarWars.com: I’m speaking to you from my parents’ house in Staten Island. Michael Giacchino: Oh, fantastic. Yeah, one of my best friends, when I was living in New York, his cousins lived there. So he would always go over and visit them. Yeah, that’s fantastic. I was closer to Philadelphia where I grew up, but I lived in New York and Manhattan, Jersey City, Hoboken for about six, seven years. 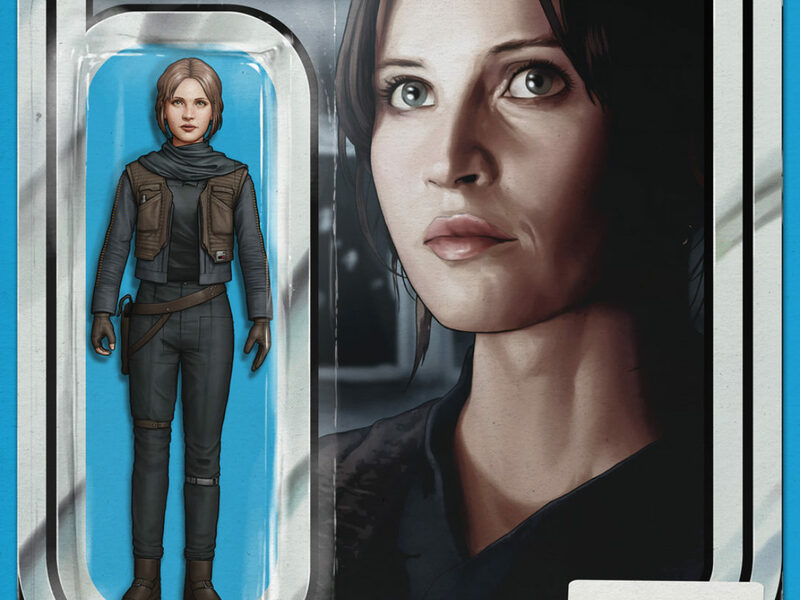 StarWars.com: Oh, wow. Well, I’ve always felt a kinship with New Jersey being from Staten Island. StarWars.com: So growing up in New Jersey, what can you tell me about how you became interested in classical music and composing? Michael Giacchino: My great uncle, my mom’s uncle, had an appliance store in Philadelphia and it was called Peter’s TV. They sold stereos and televisions and washers, dryers, all kinds of stuff. But RCA used to send them all these records that he would play on the stereo systems as demos. When they were done playing with them they would always give them to us. So my dad had this great collection down in the basement of all of those records. Those records were everything from classical music to Mexican music to jazz music — and all kinds of jazz music, from serious jazz to swing and big band. It was just literally all over the map. I just loved listening to those records and mainly because mostly what they showcased on those records were ensembles of orchestras playing, and they would be playing very melodic, fun things. I always liked melody. The more I listened to those records, while my older sister and my older brother were listening to Led Zeppelin and disco and whatever else was going on at the time, I was really listening to these records that were more from the era of the ‘50s and ‘60s, as opposed to where the ‘70s were taking us with rock n’ roll. So I just really, I don’t know, I just fell in love with it. I always loved movies like King Kong and Planet of the Apes, monster movies, Ray Harryhausen films, all of that stuff. I always loved the music in them, too. When I realized that you could actually buy some of those soundtracks on records, I would get my dad to buy them for me. I remember when Close Encounters [of the Third Kind] was out. I remember I was home sick from school one time and he brought me the soundtrack to Close Encounters. That was like, probably one of the first soundtracks that I got that was of a current movie. From then on, that was all I would listen to — soundtracks and all the other records that my dad had. It kind of was borne out of that. Growing up in the ‘70s, I had access to the greatest composers working in entertainment. 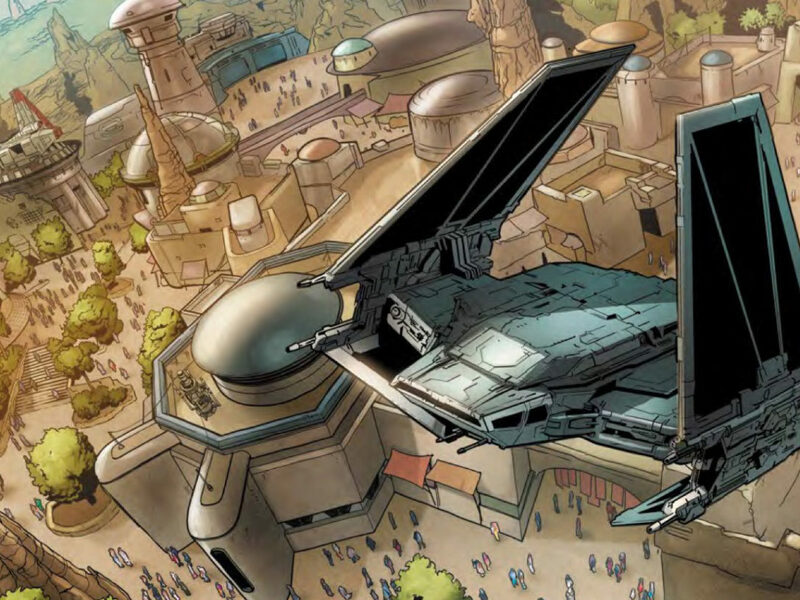 StarWars.com: It was a great time. 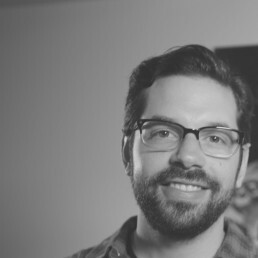 Michael Giacchino: It was an amazing time. You had Lalo Schifrin writing, you had Jerry Goldsmith writing, you had, of course, John Williams writing. It just went on and on. And even if you were watching The Twilight Zone, you had access to Bernard Herrmann and, again, Jerry Goldsmith worked on that, as well, and all of these other wonderful composers. I mean, it was everywhere, because if you needed music in those days it had to be recorded with live players. There was no such thing as music coming out of your computer like they have now. Now it’s like, 90 percent of television is just all fake music. But then it was fantastic. Every show, whether you were watching Jonny Quest or Tom and Jerry or Mannix or Mission Impossible or M*A*S*H, whatever, you name it. Happy Days, it didn’t matter. It was all live music, and I loved that. I think I just took it in. I never considered it at the time that it was live music or anything, I just knew I loved it. So I feel really fortunate to grow up in an era where that was the way you made music. Michael Giacchino: You know what, that’s actually one of my favorite bands, too. ELO and Queen… It was funny because there was this time period in my life as a kid, between maybe nine and 13 or 14, where I was like, “I don’t listen to rock n’ roll, that’s beneath me! I listen to this…!” [Laughs] But I secretly was curious about it and the more I listened to it, the more I loved it. And of course by the time I was in high school, it was “all bets were off,” and then I was adding all of that to my favorite kinds of music, which is basically everything. 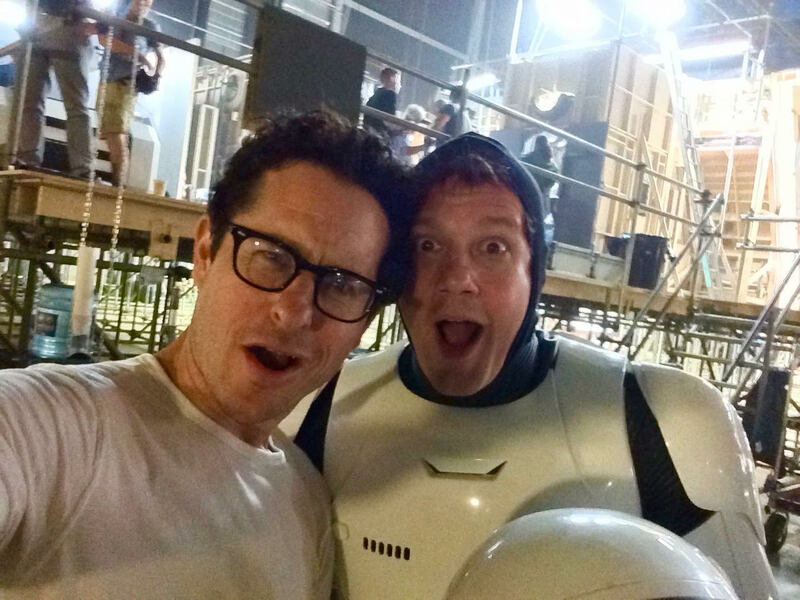 Giacchino (right), reporting for First Order duty, with director J.J. Abrams on the set of Star Wars: The Force Awakens. StarWars.com: As a film composer who grew up in a time when you could draw influence from not just symphonic scores from the past, but also rock n’ roll, how do you think that influenced the music that you would come to make? Michael Giacchino: It influenced me in a huge way. I mean, I was a huge Jonny Quest fan. Not that that was rock n’ roll, but that was the beginnings of orchestral jazz and using that in entertainment, especially in animation. But having that wide range of influences, absolutely. Now I feel like I can go anywhere I want, and it’s always fun. It’s never a chore. It’s never like, “Oh, this needs to be more of a rock-based score,” or “This needs to be more symphonic.” It’s always fun whatever it is. I’ve been really lucky to work on a wide range of films which allow me to go there. Almost every film is different and I like to work with filmmakers who want to do different things and allow me to do different things. Luckily, I get to work with a lot of my good friends who are directors, and they give me the freedom to go in these places that I want to go. StarWars.com: And what was your actual first gig where you were in charge of composing the score for a movie? Were you terrified, did you feel ready? What was going through your head? Michael Giacchino: Well, my first official film that ended up on a screen in a theater was The Incredibles. I remember in my meeting with Brad [Bird], I had mentioned that I loved Jonny Quest, and he just kind of went crazy because he loved Jonny Quest. Hoyt Curtin, who wrote all that music, and he did music for The Flintstones and a lot of Hanna-Barbera shows, we loved that guy and we loved what he did. He was so versatile and it was always also so wonderfully melodic. So we had this long conversation about him and Brad was like, “That’s how I want The Incredibles to sound!” We also loved the old James Bond movies, of course, too. John Barry really set the tone for how they should sound and did an incredible job. So it was sort of a love letter to all the things we loved as kids. Was I terrified? Yeah. I fully expected… You know, this was my first movie. I’m now working with a company that had only worked with Thomas Newman and Randy Newman, who have done hundreds of movies by that point, done tons of things. I had done nothing to that point. [Laughs] So I fully expected to be fired at some point along the way. I just remember, every day, waking up, “This is the day I get fired off of one my favorite projects ever,” because I just didn’t have the faith that they would stick with me. But they did and we had a great time doing it. Then that led to a whole lot of other things. 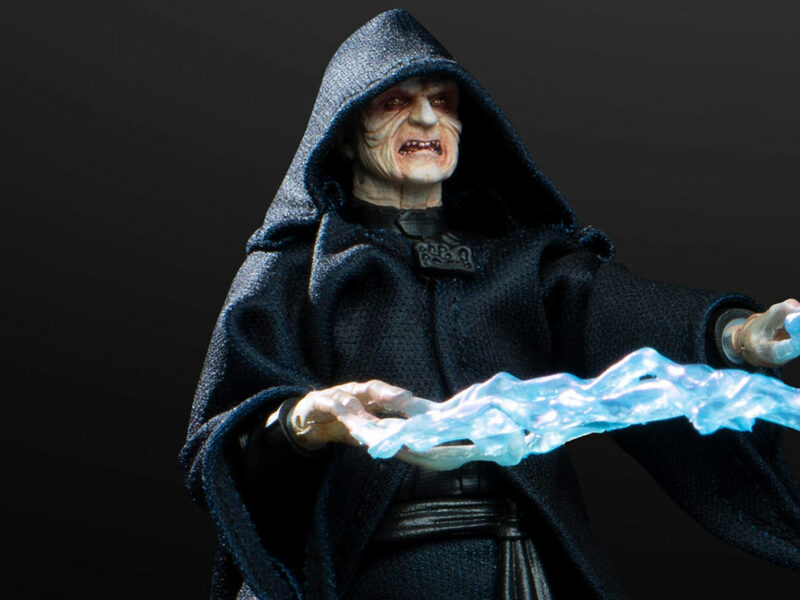 StarWars.com: Yeah, I was looking at everything you’ve done, and it’s a pretty amazing list in such a short period of time. 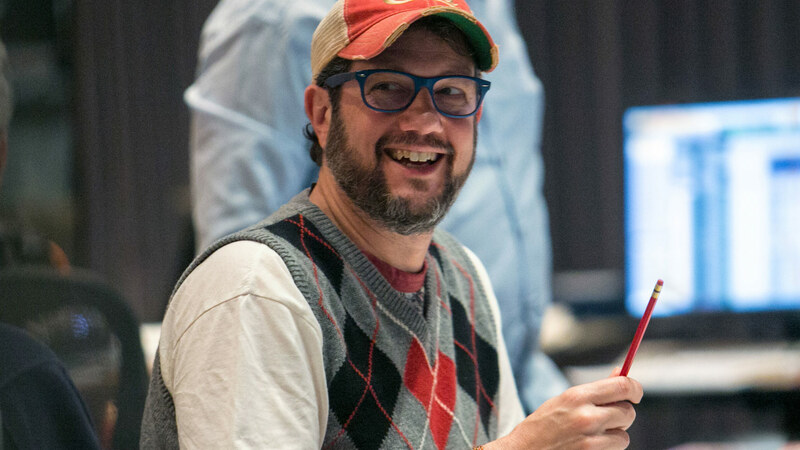 Michael Giacchino: Yeah, and I’ve been lucky. I’ve been working with people that I would have been friends with had they grown up in my neighborhood. It’s that kind of a thing, where the attitude towards what they are making is really borne out of this joy of creating something. The idea that, “Wouldn’t it be cool if…” That’s what I love about the people I work with, is that phrase is not strange to them. It’s something that will just come out of their mouth all the time. “Wouldn’t it be cool if we did X!” That’s what it was like as a kid. “Wouldn’t it be cool if we made our own version of E.T. ?” Or, “Wouldn’t it be cool if we made our own dinosaur movie?” And we would just do it. We would make movies. So that’s what I love about the people I work with. It’s not some sort of self-absorbed, crazy project that becomes more of a chore than a joy. That’s what I’m always looking for. StarWars.com: Speaking of “wouldn’t it be cool,” what’s it like composing the music for a Star Wars movie? StarWars.com: You just won’t sleep for a while! StarWars.com: Yes. Work/life/Star Wars balance. Michael Giacchino: Exactly, exactly. It’s important, it’s important. And I need that time off to just sort of reflect on what I did that day and how to make it better the next day and then move on to something else. But it was a great time, and any time that I felt under that pressure, “Oh god, how am I going to finish this,” I would just look up and there would be stormtroopers on the screen. I’d be like, “Oh hey, I’m working on a Star Wars movie. This is pretty fun!” [Laughs] The stress of it all was balanced with the joy of it all, and it all just ended up working out. 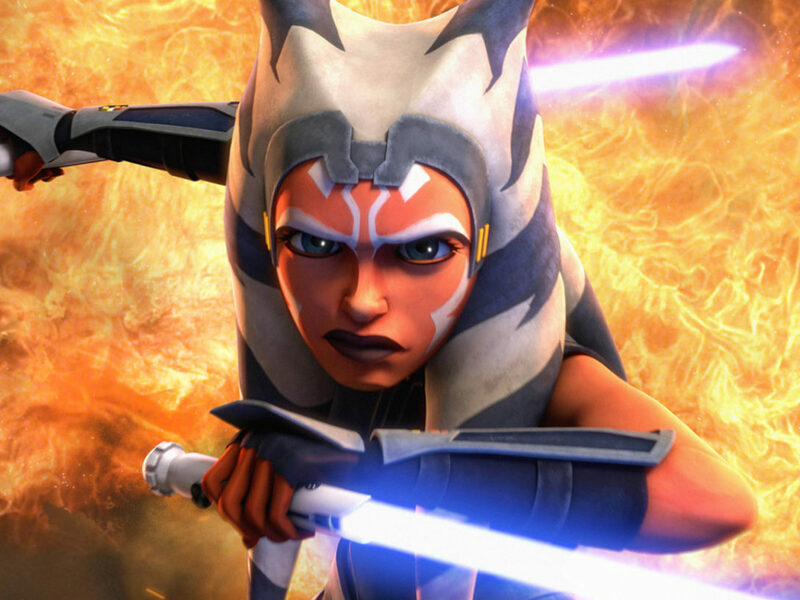 StarWars.com: It’s really a different kind of Star Wars movie in a lot of ways. Did that impact the way you were approaching it? Michael Giacchino: Yeah, to some extent. I tend to really go for whatever the emotional heart of a story is, and try to do something that speaks to that but doesn’t overpower it, so it doesn’t push the audience away. Sometimes movies can get so melodramatic that it then doesn’t feel real anymore. So I’m always trying to strike that balance of how far can I push and still have it be appropriate and not make people feel like they are being manipulated? Even though all art is manipulative, you know, in its core sense. It was an interesting time. I will say that. 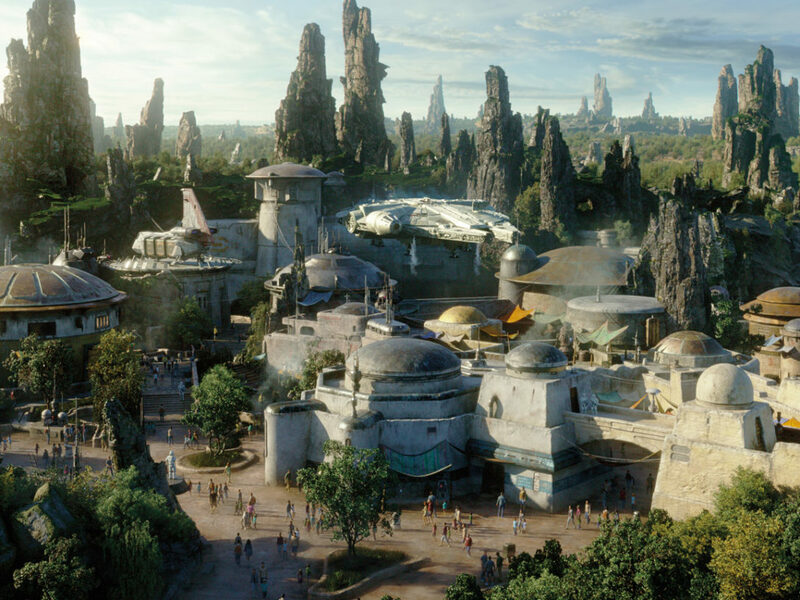 StarWars.com: One thing that I particularly liked about it was I felt like you were including some pieces of music that we knew from the older films, but then they would take a different direction. Michael Giacchino: Yeah, and I always love those. Even when I’m listening to scores or even when John would do something like that in his scores — John Williams — and they would nod to something that came before. Just those little Easter eggs that you would get and go, “Oh, yeah.” It’s a way of reminding you of the universe you are in, as well. I certainly didn’t want to say, “Hey, I’m going to do a whole new thing with this and now it’s going to sound like heavy metal!” I wanted it to feel like home. I wanted people watching it to feel like they were in a Star Wars universe. I think that’s important. It’s such a brand and everyone knows or expects a certain thing when they go to a Star Wars movie. I don’t think that’s a bad thing. I think that’s a nice thing. It’s a place that you want to return to. I know I certainly did. StarWars.com: It creates a continuity. Michael Giacchino: Absolutely. That’s why those movies are really great, because they all feel of the same cloth. There’s something wonderful about that, which I love. It’s a book that you can go back and open and feel at home. StarWars.com: So, this birthday concert. Tell me about it — how it came to be and what we can expect. Michael Giacchino: My sister, Maria, who produces all the concerts for me and deals with all of the PR stuff, had been talking to [the Royal Albert Hall] about doing something like this. We had done Star Trek there at the Royal Albert Hall and had a great time working with them. Since then she has been in conversation about, “What can we do? What can we do?” It was, “Well, Michael’s birthday is coming up. Why don’t we do a big 50th birthday party?” Now honestly, I thought I was going to be, for my 50th birthday party, just with a bunch of friends down on Ventura Boulevard doing some dive bar, or something like that. So when this came about, I was like, “Okay, well that’s different. [Laughs] That sounds a little bigger then I had expected, but okay.” But it was a fun chance to kind of go back to a lot of music that I haven’t played in concerts or haven’t even listened to in a long time, just because I don’t generally go back and listen to what I’ve done. And then put new suites together and put together a show that’s going to be not just about the music only, but just about the fun of what it is we do. Many of the directors that I worked with are going to be there, which is fantastic because, honestly, a birthday at the Royal Albert Hall would never have happened if it wasn’t for them. I mean, I am so lucky that I got to work with these guys to make the things that we did. For me, the evening is more of a celebration of, “Hey, look at what we got to do together. Wasn’t that fun?” And that’s what I really want it to be. It’s all hanging on this 50th birthday idea, but in my mind it’s really about celebrating how fun it was to make all of the projects and all of the movies that we did together. 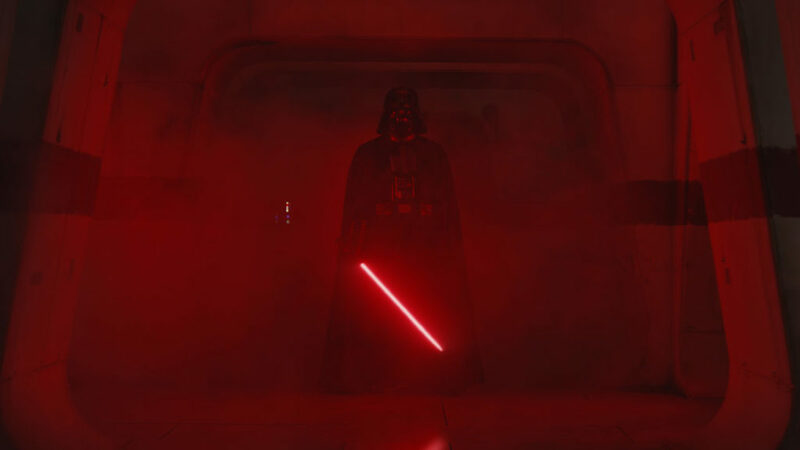 StarWars.com: Your sister sent me a clip of a work-in-progress Rogue One suite. How did you pick what you wanted represented? Was it just your favorites or what you thought represented the movie? Michael Giacchino: Yeah, I wanted something that just represented the story in general, that you could listen to and go, “Yeah, that represents that movie and the story of that film.” For sure. And these characters, that was important, too. These are new characters and new ideas and new places that we are going to. So I wanted to showcase what was new about Rogue One and just have some fun with it, and hopefully condense it to the amount of time that you can just listen to it and get a feel for everything that, basically, the film is borne out of musically. With director Gareth Edwards (left) at a scoring session for Rogue One. Photo by Jaimie Trueblood. 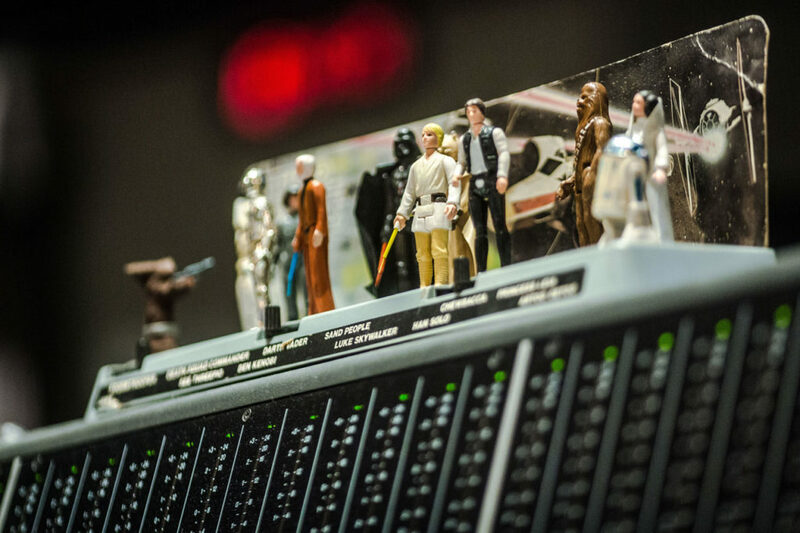 Giacchino’s original Kenner Star Wars toys at a Rogue One scoring session. Photo by Jaimie Trueblood. StarWars.com: Any final thoughts about having composed the music for a Star Wars film — the only person aside from John Williams to do it — and what that means to you? Michael Giacchino: I felt incredibly lucky to be able to do that. As I look back on a lot of the things I worked on, including Star Wars… This is true — I used to draw all the time. My mom saved all these sketchbooks. In those sketchbooks are drawings of Planet of the Apes, drawings of Spider-Man, drawings of Star Trek, like the Enterprise and the characters. I have tons of drawings of Star Wars, whether it be stormtroopers, Darth Vader, Star Destroyers, or the whole thing. My whole childhood revolved around these projects in some way. These ideas, these stories. I grew up with them. To see that now, at 50, I have worked on almost every one of those… [Laughs] That’s a crazy thing. And Star Wars was sort of like the cherry on the sundae after having done all of the things that I have done. To get to do Star Wars was kind of like, “Okay, well, you have now done all the things that you have grew up with and loved. You got to be a part of those worlds.” To be able to say that, I feel like the luckiest person on the planet. StarWars.com: That’s awesome… I have an idea to pitch to you. StarWars.com: ELO live at the Hollywood Bowl. Orchestra conducted by Michael Giacchino. Michael Giacchino: You know, I would love that. Believe me, I would love it. Actually, it’s so funny that you say that, because I had even talked to my sister. I was like, “What can we do with ELO? What can we do with those guys that would be really cool or to celebrate them in some way?” Because she is a huge fan of them, as well. She’s seen them in concert. She grew up going to Led Zeppelin concerts and going to see all this stuff. I would love it. I would love it. StarWars.com: All right. Maybe for your 51st birthday. StarWars.com: That’d be great. Can’t wait. Michael Giacchino: [Laughs] Yeah, we’ll see.